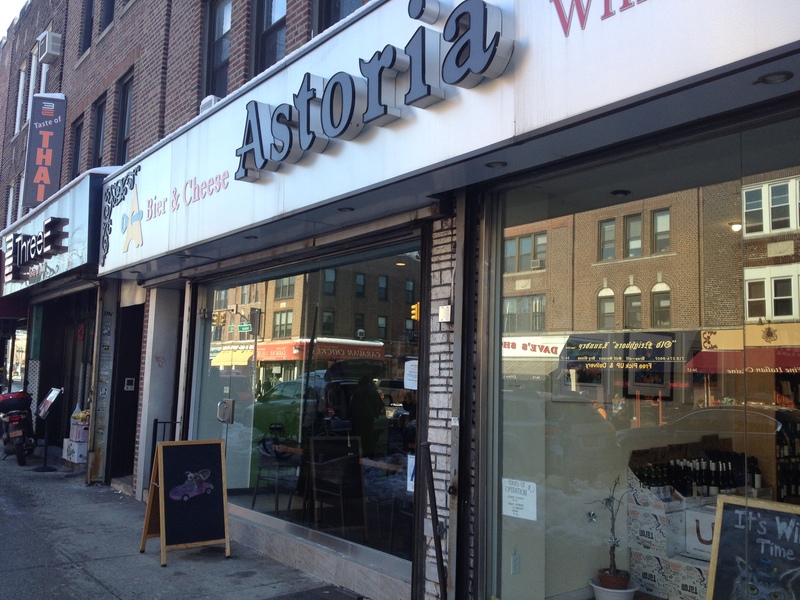 Eric : I spent a few hours at one of the most aptly named places in NYC…Astoria Bier and Cheese. I learned a lot. 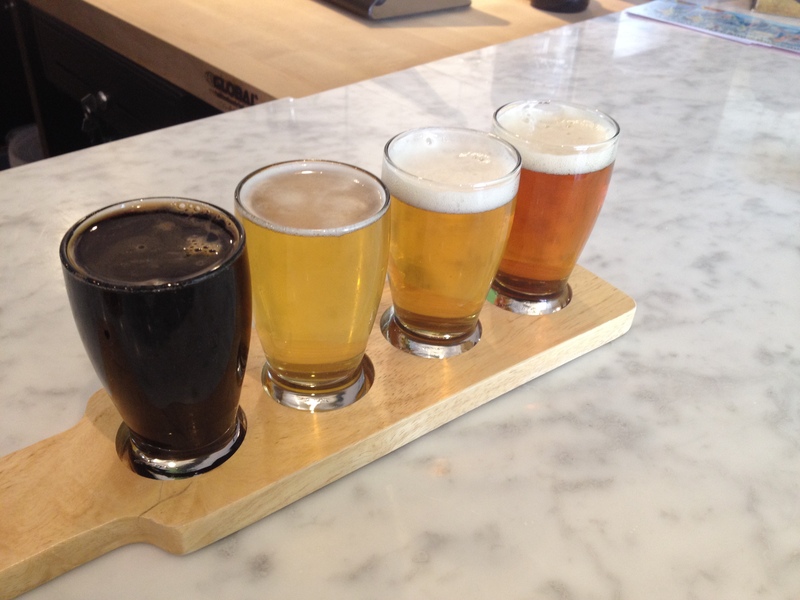 Most importantly, beer goes great with cheese, even more so than wine does. But that’s mostly because beer is better than wine. The space is bright, airy and relaxing, with table and counter seating. They have a ton (a TON) of cheese and meats, 10 rotating taps, and an interesting menu that not surprisingly highlights cheese and meat. 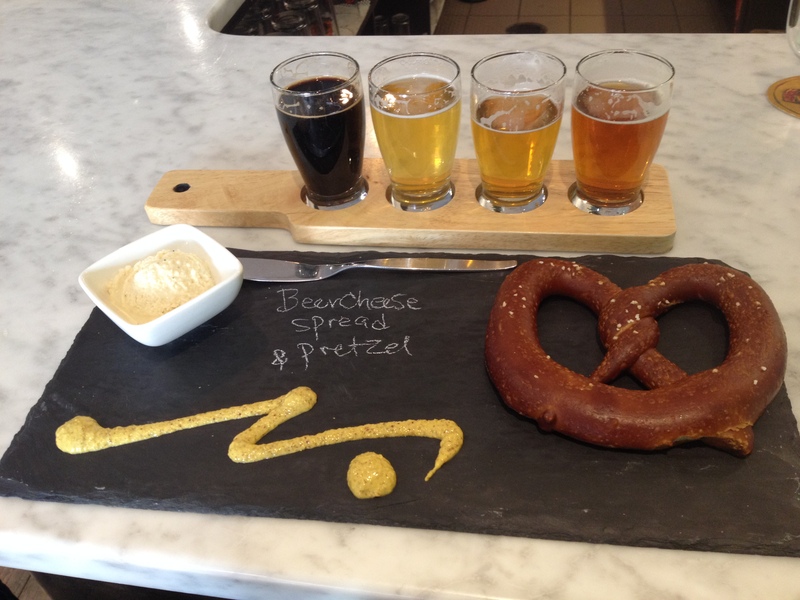 I started off with a warm Sigmund Pretzel with house-made bier cheese ($5). The pretzel was perfectly chewy, and the beer cheese (made of a blend of cheeses with whichever pilsner/lager they have on tap) was smooth, bubbly and pungent. It has the consistency of whipped butter, so it was easy to spread on the pretzel, dip in a bit of mustard, and go at it. 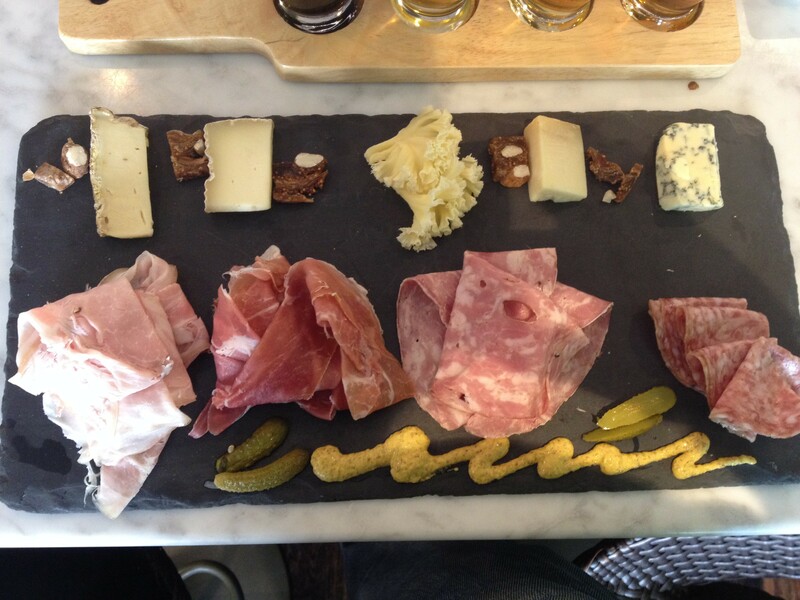 Next up was The Works ($20), a serious meat and cheese plate with five cheeses and four meats. Like the beer, the cheese and meats rotate, but they try to always have certain styles in stock. The cheese highlights for me were tomme crayeuse (from France; light, creamy, mushroomy) and tete de moine (from Switzerland; pungent, nutty, beefy). They went well with a 16 month prosciutto di san daniele (Northern Central Italy) and Salame Milano (Milan style from Utah…yes, Utah). Their recommended pairings work great, but why not mix and match and go totally crazy?! You’ll discover some really good new combinations. 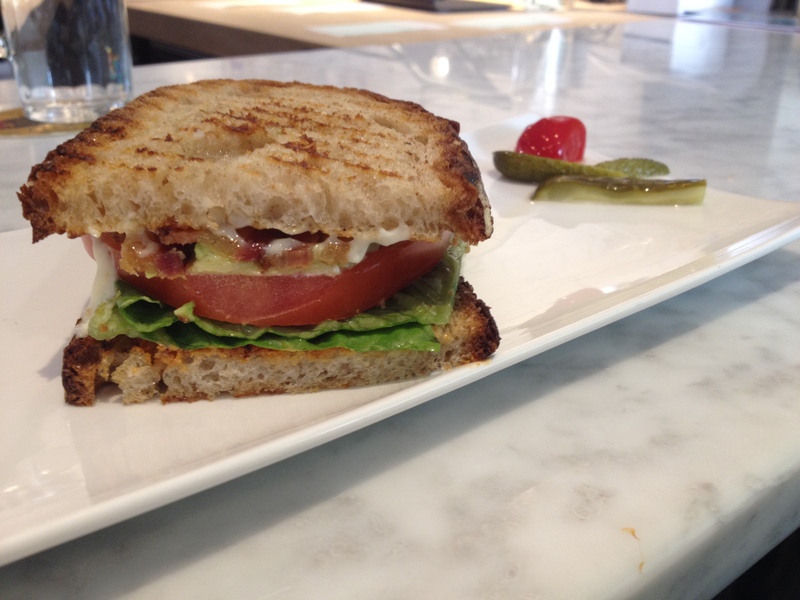 I finished with an amazing BLT ($7.50) with avocado and chipotle ($1 extra). The lettuce and giant tomato slice were fresh and crispy, and the bacon was thick, juicy and crunchy. The chipotle mayo was HOT, but like well spiced food, it didn’t linger afterwards. The creamy avocado was a perfect complement to the heat. I ate all this while drinking from my beer tasting flight ($10), which was four pours. I had a Founder’s Imperial Stout, Off Color Troublesome Gose, Barrier Greenroom Pale Ale, and Alesmith IPA. I liked them all, but the best accompaniments with this type of food were the Stout and Gose. Founder’s Imperial Stout has a rich coffee, chocolate and smoke aroma and flavor that brought out some nuttiness in the cheeses, and paired very well with the strong tasting bier cheese. Stouts also go well with most smoked foods, so it was perfect with the meats and bacon. Off Color Troublesome Gose is usually not my favorite type of beer, but I liked it with this food pairing. The tangy funk, salt and coriander were a nice refreshing palate cleanser after each bite. 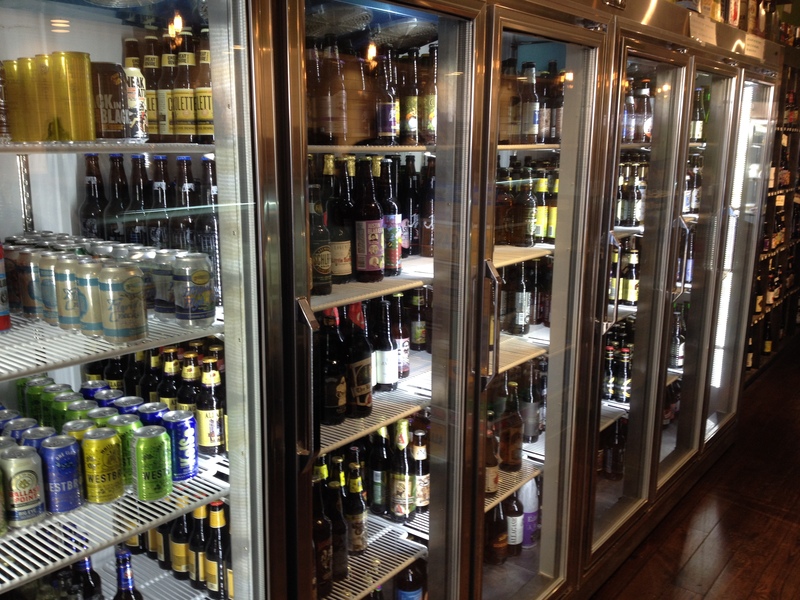 If you fall in love with some cheese, meat or draft beer, they are all available to go. In addition, they have a small but well-utilized store set-up. Pick up some jarred pickles from Brooklyn Brine or McClure’s Bloody Mary Mix. They also have nearly 300 bottles for sale, including some rare stuff like Crooked Stave’s just released Nightmare on Brett and Cranberry & Spices, and Dieu du Ciel’s Peche Mortel. Their overall philosophy with beer, cheese and meat is to support local while also sourcing the best available from all over the world. When you eat and drink here, you can taste it! It’s a great place for a snack, lunch, dinner or just some beers. March 3, 2014 in Bars, Beer, Restaurants.